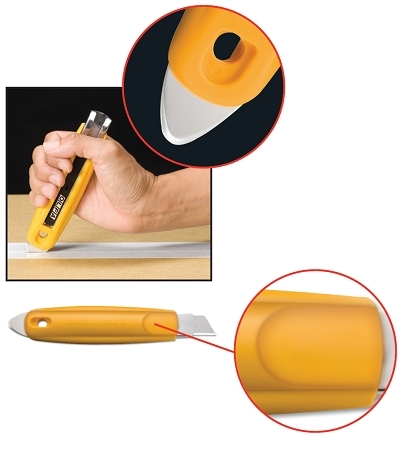 This versatile cutter features a durable rounded metal tip designed to function as a tape slitter, screwdriver and staple-remover. Its comfortable handle and blade slide are gently curved for comfort, featuring a finger groove on back to help secure grip when cutting. Stainless steel blade channel holds blade tight. Cutting depth: 0.75"; 19mm. For right- and left-handed users. Includes SKB-2 Blades. Fits SKB-2, RSKB, HOB Blades. SK9 knives are sold in multiples of 6.